Context: Environmental grassroots non-profit organized to prevent a $50 million industrial development that would be harmful to mid-coast Maine. 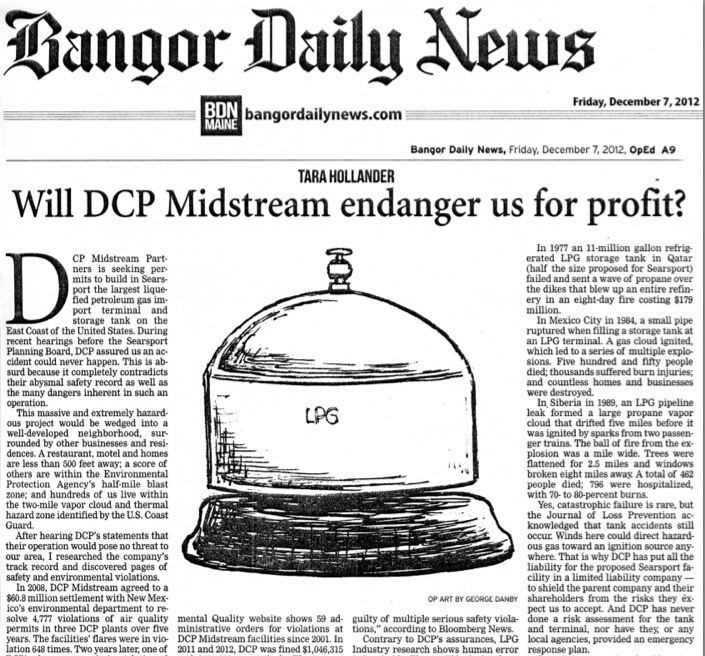 This incredibly dangerous project was given fast track permits by the Army Corps and Maine Department of Environmental Protection and other agencies, but a grassroots organization – Thanks But No Tank – organized and achieved successful ruling in 2013.
Who & When: Op-ed was written and published in the Bangor Daily News December 2012 to refocus issues. What & How: Researched detailed records of environmental violations, wrote pivotal testimony, and edited testimony for published Op-Ed. Educated citizens, community leaders and town officials which refocused the issue.